The first impression is good. The white and gray finish provide it a sleek look and the plastic seems sturdy. Its lightness is surprising. That's a good point for people planning to take the R16 everywhere with them. This compact interface has nine faders but is slim enough to fit in any backpack. It's obviously much more bulkier than a portable recorder, like M-Audio's MicroTrack II or Zoom's H2, but it offers incomparable recording possibilities! 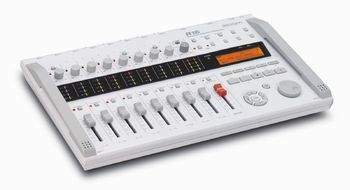 It reminds me a lot of digital integrated studios from Tascam, Roland, Korg, or... Zoom! 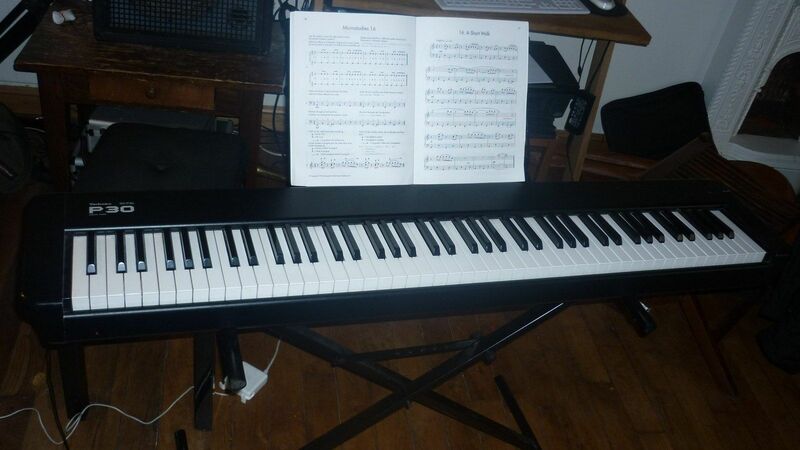 The plastic buttons and faders feel a bit toyish but you can't really expect more for the price. 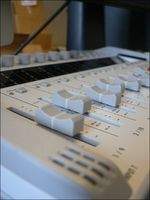 Do watch out for the faders because they get loose pretty easily. 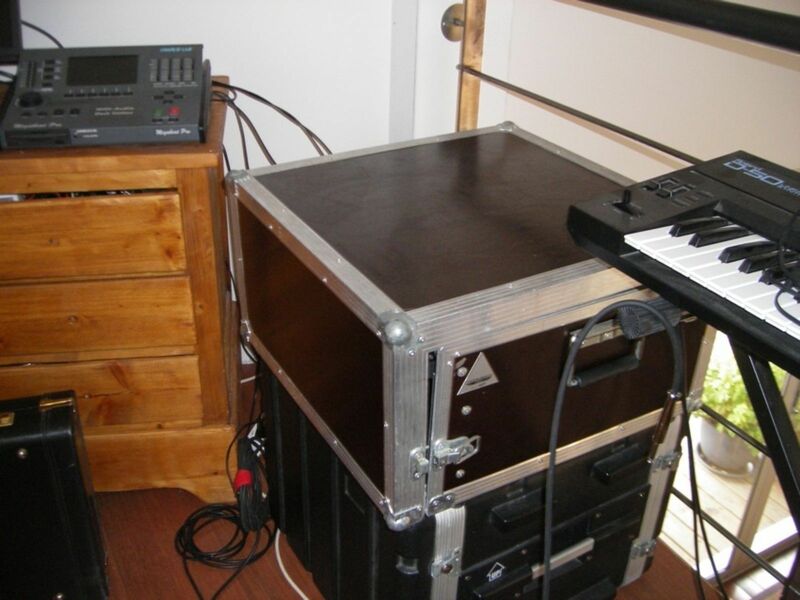 The R16 is sold with Cubase LE 4, a 1GB SD card and an external PSU. You can also use six AA batteries for 4.5 hours of life (according to the manufacturer's specifications). On the rear panel you'll find eight analog inputs on XLR-1/4" combo connectors. 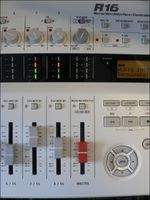 The interface includes eight mic preamps so you can connect up to eight mics. Nice! Nevertheless, only inputs 5 and 6 provide phantom power for condenser mics and input 1 is the only one that accepts high-impedance signals, so you should connect guitars and basses to it. That way you'll also be able to use the FX and guitar amp simulations of the R16. The interface is equipped with two mics (same model as on the Zoom H2) whose signal you can route to inputs 7 and 8. They can be very useful when you don't have a mic at hand but want to record an idea on the spot. Regarding outputs, you have a master output on 1/4" jacks for your studio monitors and a headphone output, both of which have dedicated volume controls. Simple and effective. On the left side of the unit you'll find an SDHC card reader compatible with cards up to 32 GB, which ought to be more than enough. Apart from that it has two USB connectors with different functions: the slave USB connector must be connected to a computer while the master USB connector is conceived for a USB stick or a non-bus powered hard drive. When the R16 is used as a standalone recorder all data is saved in the SD card. 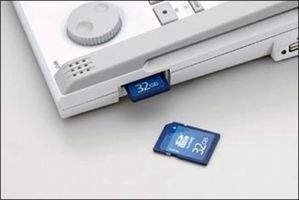 You'll have two options to transfer the data afterwards: either you connect the R16 to the computer with a USB cable, switch the interface to card-reader mode and use it as a standard SD card reader, or you connect a USB stick/hard drive to the R16 and transfer the files with the USB Storage mode. This option comes in very handy when you want to give the master file to the musicians at the end of the recording session without turning on your computer. Each track has its own unmotorized fader, four-segment level meter, gain control, and peak LED for input signal overloading. Right above the fader a play/mute/rec button allows you to mute or arm the track. Above the master track you'll find a mix control to mix the signal from the inputs with the signal from the sequencer (when the R16 is used as a digital audio interface) or the internal metronome (when used as a portable recorder). The metronome signal can be routed to the headphones or to the headphones and monitor outputs. On the right, you'll find the transport keys (play, record, fast forward, rewind, and stop). With the small jog wheel you can set the value of parameters in the different menus, while the buttons to its left are meant to allow you to browse through the menus and sub-menus. 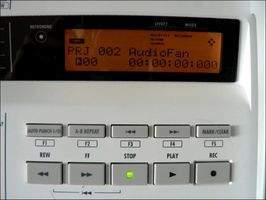 There are also buttons to program punch ins/outs, which is very convenient for lonely musicians because it allows them to start playing and recording from a preset point in the song. It's also possible to loop one or several bars of a project using the A-B button, to learn a complex part of a song, for example. Finally, the mark/clear button allows you to set markers in a song, which you can quickly access using the "next marker" and "previous marker" buttons. The display is placed above the transport keys. It's nothing extraordinary, a common monochrome LCD with two lines of 20 characters each. You'll have to get on with this utterly obsolete solution, even if we are nowadays used to large screens, keyboards, mice, and even touch screens! The R16 makes you feel like your going back in time to the frugality of old-time interfaces. I don't want to sound too dramatic, I mean, we all used such gear a decade ago and we are still alive, right? Still, considering the technological possibilities available today (see the iPhone review) it's awkward to have to read through a thick user's manual and press buttons a dozen times to edit a parameter. Above the display you'll find two buttons to toggle between tracks 1-8 and 9-16, a USB button to use the R16 in sound card mode, in SD card reader mode or in USB stick/hard drive mode without the need of a computer. The Swap/Bounce button toggles between two modes: Swap mode allows you to exchange two tracks, whereas mic and guitar inputs are assigned to specific tracks. This function might turn crucial sooner than you think! Bounce mode allows you to make the final mixdown on the stereo master track or bounce several tracks into one track, like in the good old days. In this mode, you can decide if the target track is included in the bounce or not... Clever. The R16 provides an undo/redo function but it is limited to one operation, so you are allowed to make only one mistake, not two... my hands are trembling with fear. The Project button allows you to manage data (create, load, copy, delete, rename, or protect projects and audio tracks). It seems to be quite exhaustive and apparently no function is missing. It's also possible to switch to 24 bits and to create playlists of your projects, which can be very useful for musicians who need to play back music on stage! Use the Tool button to access functions like the metronome and chromatic tuner (which BTW isn't very effective), but also to access system settings (date/time, etc.). Here's where you can change the SD card – in the "Exchange" menu (you'll be prompted to insert another SD card without having to reboot the R16). You can also format the card and check how much free space is available on it. And if you ever want to link two R16 in order to get more inputs/tracks you'll have to select Master or Slave mode here. Each track has its own pan control, 3-band EQ and phase inverter, as well as a stereo-link function to record two signal sources creating a stereo file. Press the Pan/EQ button to access these settings. You can also control the send level of the two aux busses called "Reverb" and "Chorus". The reverb effect provides four algorithms (hall, room, spring and plate) with parameters like pre-delay, decay, EQ high, EQ low, etc. The other effect allows you to add a delay or chorus to each track. Parameter settings are standard: depth, rate, pre-delay, etc. for the chorus effect, and time, feedback, Hi damp, etc. for the delay effect. 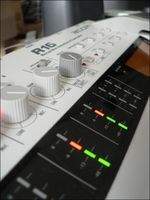 The R16 also offers numerous insert effects to, as the name implies, insert them in the tracks, but you can also place them directly after the input stage so you can record processed signals (like a guitar processed with a distortion effect, for example). You can also insert mastering effects in the "master" track like a 3-band compressor, a normalizer, a 3-band EQ, a lo-fi module for trashy results, a dimension module for stereo field enhancement, and a resonance module. Finally, the R16 is equipped with a noise reduction system called ZNR. The insert FX list is very long and it comes with plenty of presets. You'll find effects like autowah, phaser, ring modulator, guitar and bass amp simulations (Marshall, Mesa Boogie, Fender, SVT, Hartke, H&K, etc. ), as well as standard effects like chorus, pitch, EQ, delay, tremolo, etc. 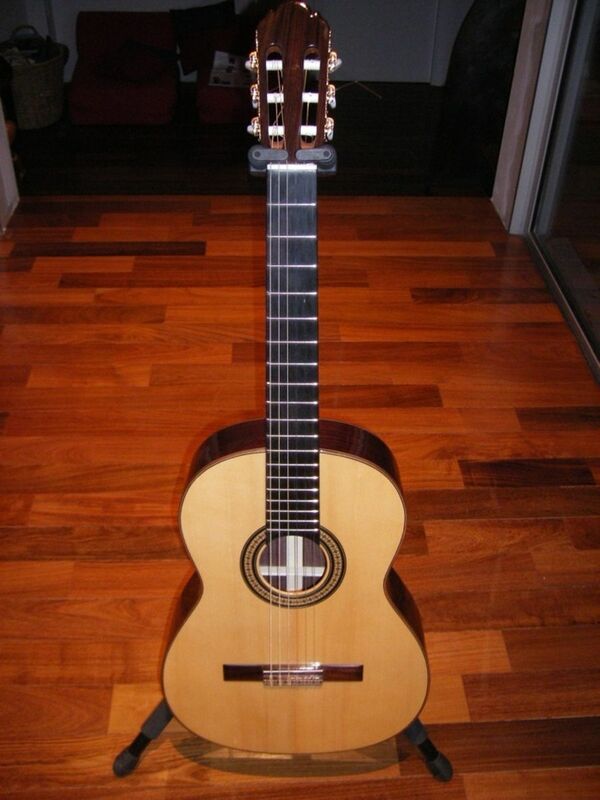 In short everything a 6, 5 and 4-string enthusiast would need. The R16 also offers microphone simulations (U87, SM57, C414 and MD421) and all sorts of effects. The list is very long and it would be boring to name them all — let's just say it provides 390 presets for 135 effects. It's possible to use eight compressors and eight EQs simultaneously, not bad! 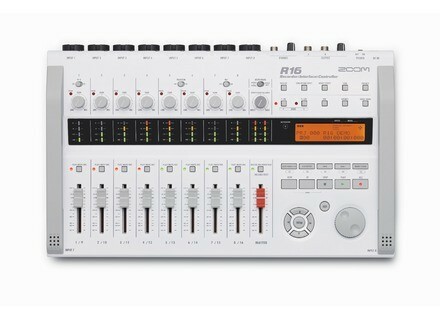 But the R16's most distinctive feature is that it's a digital audio interface and a controller. It comes with Mac and Windows compatible drivers (and the firmware can be upgraded via USB) so you can assign the eight tracks directly to your favorite sequencer (or to the Cubase LE4 provided) and route two master returns to the R16 to feed your monitors. The digital audio interface mode of the R16 is very practical and really stunning considering the price of the product. 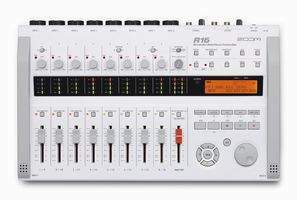 But the most surprising feature is that you can use the R16 as a MIDI controller too, allowing you to use its transport buttons and (unmotorized) faders to control your sequencer via a Mackie Control emulation. We tested this function – whose description takes up no more than one page of the user's manual's and doesn't even say which MIDI controllers you can use with the R16 – with Presonus Studio One, Reaper and Cubase LE 4. Does it work? Yes, but it could be improved: the transport buttons, jog wheel, arrow keys, and all five function buttons work fine but we were unable to use the Enter/Exit buttons and the track's Mute buttons worked as solo buttons. Is it that bad? Not really, but we would have liked to be able to read about it in the user's manual (a simple MIDI implementation chart with the controllers available and their default assignment would suffice). With Cubase LE4 (provided with the R16), the control surface configuration mentions a shift button we never found. It's a pity because such a button would double the number of available controls. Finally, we want to point out that track gain controls have no MIDI function, i.e. you will not be able to use them to set the track's panorama. In short, this MIDI mode is a great asset but it should be improved with a more logic design and with more information in the user documentation. Considering it's priced under $400, it has eight preamps and 135 effects you probably won't think much of the R16's audio quality. We tested the mic preamps with a DPA 1099 and it turned out to be a very demanding mic for the preamp. In other words: there was no miracle, we had to turn the gain nearly to the max and the noise increased proportionally and fast. On the other hand, the converters and the two integrated mics (from Zoom's H2) sound rather good. Watch out for handling noise when the integrated mics are active, the mechanical noise of the buttons can be clearly audible! You will be able to record demos fast and easy, which is the R16's main function. Effects are plentiful and effective but amp modelings lag behind the quality of Line6; you get the Zoom sound. Compressors tend to pump and amplify noise but we'll overlook that, considering the price. EQs are decent and work fine. The R16 does its job alright, proving it's a very comprehensive, standalone and ready-to-use tool. Finally, there's only one thing left to do: music! Zoom strikes a decisive blow offering hybrid technology at a very affordable price. Surely many musicians looking for a portable 16-track recorder, an audio interface and a MIDI controller will enjoy the R16. The R16's main advantage is that it's a real standalone product with effects, mics, SD card reader, tuner, and metronome. Nevertheless, we wish it had more headphones or line outputs because It is impossible to provide different monitor mixes to several musicians, forcing you to buy an additional headphone amplifier. The fact that only two mic preamps have phantom power, the headphones and master output level controls are on the rear panel and the documentation doesn't describe sound card and MIDI controller applications enough might annoy some. But considering the price, such details won't keep you from trying to get your hands on it. Hats off Mr. Zoom!